We are a distributed team of content facilitators, book designers, illustrators, and copy-editors who work with radical efficiency and are crazy about book production. 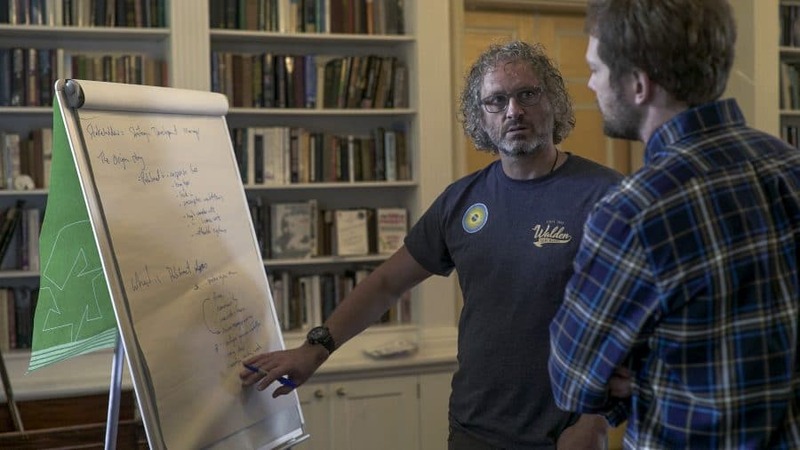 The original idea of a Book Sprint was initially conceptualised by Tomas Krag in 2005 as a collaborative writing process that would take place over several months. Building on this idea, Adam Hyde designed a method in 2008 for an intense, five-day sprint-style event to write documentation for Free/Libre Open Source Software. After seeing that this had potential, he experimented with it in a number of contexts over the next four years, testing and refining the method. In 2013 he founded the company Book Sprints Ltd and trained some new facilitators in what by then was a robust methodology. These facilitators have brought their own individual styles to the Book Sprints method. Around the same time, the company built up a production team of designers and editors, which very much shaped what we now offer as the Book Sprints services. We can now safely say that the method can be used for any subject, from industry guides to fiction. Barbara has been the CEO of Book Sprints since 2016, and focuses on streamlining our service and workflow, developing new formats and diversifying the company’s client base. Previously the lead facilitator at Book Sprints for three years, she continues to facilitate Sprints. As a facilitator, Barbara’s background in cultural anthropology and documentary film makes her observant and attentive to each group’s unique process. She facilitates in English, German and Spanish. Adam is the founder of Book Sprints Ltd. He developed the Book Sprints method in 2008 and ran the company until 2016. He currently plays a role as an advisor and spends most of his time as the co-founder and Technical Lead of the Collaborative Knowledge Foundation. He also led the design and development of Editoria, the book production platform we use for Book Sprints, and sometimes still facilitates Sprints. Karina supports Barbara in improving the operational systems and business processes from the Berlin office. With her background in instructional and service design she is responsible for creating an optimal service experience for our growing client base. Previously, she has worked as a Project Manager in Higher and Civic Education and uses her expertise in digital media and online learning to develop new output formats according to the needs of our clients and partners. Faith’s experience in rapid production for activism campaigns as well as her skills in organising and communication in the NGO sector are now being put to good use at Book Sprints. In her role as facilitator, she helps Book Sprints groups to think clearly about who they are writing for and to build a collective argument. She also assists on much of the communication and content strategy for Book Sprints Ltd.
Laia brings to facilitation more than 10 years of experience as a cultural producer working all over the world with all kinds of groups, as well as fluency in multiple languages. She is able to help any kind of Book Sprints group to reach confluence, and pushes groups to peak productivity while keeping a hawk’s eye on the design process at the same time. She facilitates in English, French, Spanish and Catalan. Henrik turns Book Sprints participants’ hand-drawn sketches into beautiful and informative illustrations in no time at all. He works closely with our book designers to agree on a colour palette and visual style for each book, and is versatile in a broad range of styles for illustrating technical manuals, policy handbooks, or even novels. He produces graphics in close collaboration with participants, whether on site at the Sprint or working from his studio in the Netherlands. Lennart is an illustrator, book cover designer and graphic artist based in The Netherlands. He works with Henrik to support the unique illustration workflow needed for rapid book production, and creates beautiful cover art for the books. He is often one of the last people working on a Sprint, to finish the visual design by the end of the five-day deadline. Agathe has a unique skill set, translating her 10 years of experience as a graphic designer into CSS/HTML book design. She consults previous publications produced by the client, takes into account the tone and register of the content being produced, and starts to draft a book design on the second day of the Sprint. This is uploaded to Book Sprints’ book production platform Editoria, where participants can actually see the book coming together. Julien spent many years perfecting the art of CSS/HTML book design and developing our unique design workflow at Book Sprints. His extensive knowledge of fonts, colours and typesetting is invaluable. As one of the main UX designers for Editoria, he has also designed over 50 books for Book Sprints. Having trained Agathe in Book Sprints’ CSS/HTML workflow, he currently plays a supporting role during Sprints. Raewyn is our editor, based in New Zealand. When the Book Sprint participants go to bed, Raewyn begins her work cleaning and structuring their text. She typically runs through the living text two to three times online and then does a final proof of the PDF once the Sprint is over. She has edited more than 50 books at high speed, which is essential to the smooth functioning of a time-sensitive Sprint. Her background in web development, policy advice and education together with her continued work as a dance critic ensures she is comfortable with a vast range of topics. Frank is our editor for German Book Sprints. His background in diverse areas such as philosophy, theater studies, psychology, public law, economics, computer and cognitive science ensures that with each Sprint he has some familiarity with the content. Before he joined Book Sprints, Frank was a lecturer in Theater Studies at the Freie Universität Berlin. Juan uses his experience developing multiple publishing systems – including the first versions of PubSweet, Lexicon, Booktype and BookJS – to provide technical support for Book Sprints. He also maintains Book Sprints’ systems and does some development work as needed.